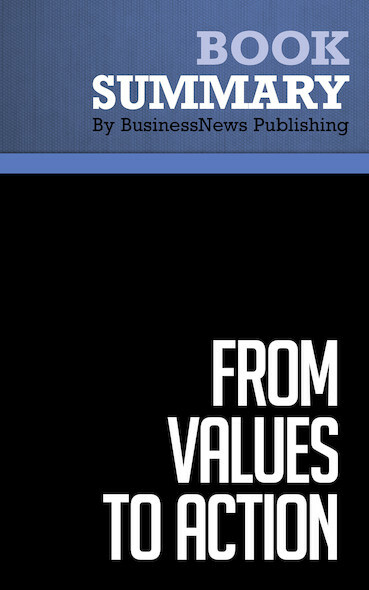 Summary : From Values To Action - Harry M. Kraemer Jr. The must-read summary of Michael Port's book: "Beyond Booked Solid: Your Business, Your Life, Your Way ﻡ؛­ﻅﻡﻑ٥ Itﻡ؛­ﻅﻡﻑ٥s All Inside". This complete summary of the ideas from Michael Port's book "Beyond Booked Solid" shows that you have to reach the stage where you are "booked solid" ﻡ؛­ﻅﻡﻑ٥ where youﻡ؛­ﻅﻡﻑ٥re getting as much work as you can handle by yourself. Once you reach that stage, a new challenge arises. You now have to grow and develop your business so, instead of being a small operation which takes all your time and energy, it becomes a bigger and better business which pays you more while you work less. The Beyond Booked Solid Challenge is to turn a one-person operation into a highly successful and self sustaining enterprise which can serve more clients than ever before. This summary will teach you how to leverage what youﻡ؛­ﻅﻡﻑ٥re good at so you can spend more time doing that and less time doing all the other stuff thatﻡ؛­ﻅﻡﻑ٥s required. To learn more, read "Beyond Booked Solid" and find the key to choosing the business architecture thatﻡ؛­ﻅﻡﻑ٥s most appropriate for your circumstances and preferences.